On 1 January 1915, ramifications from the First World War, raging half a world away, were felt in Broken Hill, Australia, when in a guerrilla-style military operation, four citizens were killed and seven wounded.It was the annual picnic day in Broken Hill and a thousand citizens were dressed for fun when the only enemy attack to occur on Australian soil during World War I, took them by surprise. Nicholas Shakespeare has turned this little known piece of Australian history into a story for our time. Riveting… this perfectly articulated story from the byways of the Great War is not about mighty cataclysms, balances of power gone wrong and men dying in trenches. It is a set of accidents in a context capable of becoming fraught in a country town in Australia. English novelist Ford Madox Ford said the death of a mouse by cancer is the sacking of Rome by the Goths. This very sad story, steady, stoical and unrhetorical in the way Nicholas Shakespeare tells it, restores to a human scale what wanton death, suicidal defiance in the name of Allah, explicable grievances and absurd tragedy look like with real human faces. I do not expect to read a more formidable piece of short fiction this year. 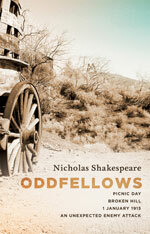 The first great novel of the year, Nicholas Shakespeare’s Oddfellows is a sublimely sparse and economically elegant powder keg of a story, detonated by an historical event that resonates explosively a hundred years since… Shakespeare’s shape of the story is sheer craftsmanship and the precision of his prose is a shimmering peak of imagination and imagery. This slim novella is much more than an historical account. Every character is so beautifully drawn and sketched out, it has the feel of a major novel… Shakespeare’s beautiful, lucid prose makes it a joy to read. I can’t recommend it highly enough. In fact, I reckon, I reckon, I reckon it’s a minor masterpiece. Bruce Chatwin 1999 (Shortlisted Whitbread Book of the Year). Bruce Chatwin’s death from AIDS in 1989 brought a meteoric career to an abrupt end, since he burst onto the literary scene in 1977 with his first book, In Patagonia. Chatwin himself was different things to different people: a journalist, a photographer, an art collector, a restless traveller and a best-selling author; he was also a married man, an active homosexual, a socialite who loved to mix with the rich and famous, and a single-minded loner who explored the limits of extreme solitude. From unrestricted access to Chatwin’s private notebooks, diaries and letters, Nicholas Shakespeare has compiled the definitive biography of one of the most charismatic and elusive literary figures of our time. Quite simply, one of the most beautifully written, painstakingly researched, and cleverly constructed biographies written this decade. Shakespeare has a quite extraordinary empathy for his subject, whom he portrays with humor, warmth, and an eye for telling detail, creating a book almost as original, intelligent, and observant as those by Chatwin himself. In Tasmania, 2004 (Tasmania Book Prize, 2006). In this fascinating history of two turbulent centuries in an apparently idyllic place, Shakespeare effortlessly weaves the history of this unique island with a kaleidoscope of stories featuring a cast of unlikely characters from Errol Flynn to the King of Iceland, a village full of Chatwins and, inevitably, a family of Shakespeares. But what makes this more than a personal quest is Shakespeare’s discovery that, despite the nineteen century purges, the Tasmanian Aborigines were not, as previously believed, entirely wiped out. Bruce Chatwin is one of the most significant British novelists and travel writers of our time. His books have become modern-day classics which defy categorisation, inspired by and reflecting his incredible journeys. Tragically, Chatwin’s compelling narrative voice was cut off just as he had found it. “Bruce had just begun,” said his friend, Salman Rushdie, “we saw only the first act.” But Chatwin left behind a wealth of letters and postcards that he wrote, from his first week at school until shortly before his death at the age of forty-eight. Whether typed on Sotheby’s notepaper or hastily scribbled, Chatwin’s correspondence reveals more about himself than he was prepared to expose in his books; his health and finances, his literary ambitions and tastes, his uneasiness about his sexual orientation; above all, his lifelong quest for where to live. Comprising material collected over two decades from hundreds of contacts across five continents, Chatwin’s letters are a valuable and illuminating record of one of the greatest and most enigmatic writers of the twentieth century. Priscilla, The Hidden Life of An Englishwoman in Wartime France, 2013. Priscilla was the author’s mysterious aunt, who lived on a mushroom farm in East Wittering, overlooking the Isle of Wight. The eldest daughter of the author and broadcaster S.P.B. Mais, she had spent the war in Occupied France, married to an impotent Vicomte. For four years, Priscilla listened on pain of death to her father on the BBC. All through this time, her father never knew if his daughter was alive or dead; but nor did he ever learn what she had to do in order to survive – and how, as an enemy alien, she was forced to make choices that none of her family or friends in England ever had to face.